By re-processing existing, public-domain data, I produced a series of "VNC-like" 1:250K topos for the civilian air search-and-rescue group in Smithers (CASARA) to use as navigation maps. 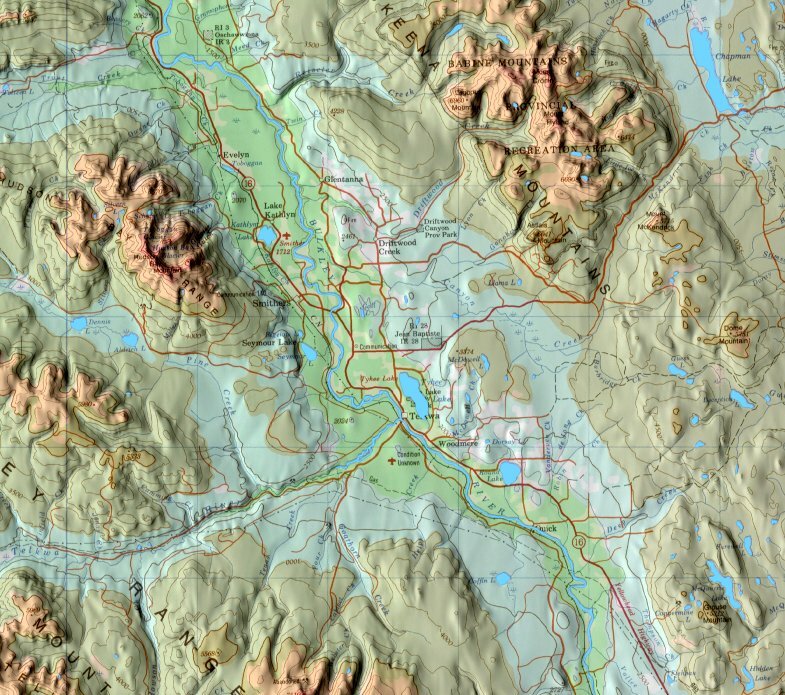 These combine the NTS 1:250K topographic base with the shaded relief and hypsometric tinting found on the 1:500K Visual Navigation Charts used by pilots. I begin with a CanMatrix image of a 1:250K topo map (downloaded from Geogratis) and overlay a semi-transparent layer of hypsometric (elevation) tints generated from a DEM for the same map (downloaded from Geobase). 3DEM generates the shaded relief. As a final step I overlay opaque waterbody polygons from NTDB data (also from Geogratis) in order to make lakes and ocean stand out more boldly. Read a complete, step-by-step description of the process.